top L to R: Shigema Genyu, Kaneshi Eiko, Kaneshiro Kenji. Interview with Shimabuku Tatsuo students: Kaneshi Eiko, Shigema Genyu and Kaneshiro Kenji. 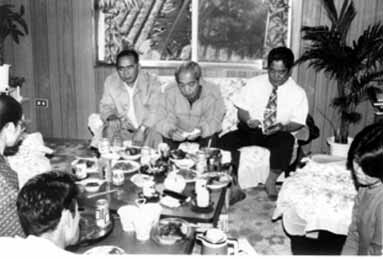 At the home of Ikemiya Hiroshi, Taba, Gushikawa Shi, Okinawa, December 24, 1984 2:00pm to 7:00pm. Present were Arcenio and Michie Advincula, Cyrus G. and Etsuko Bess, my brother and sister-in-law, Ikemiya Hiroshi and his wife Ikemiya Yasue. Excerpt from this meeting which was recorded on audio cassette tape. Kaneshi Eiko Sensei was 70 years old at the time of the interview. He began his training from Shimabuku Tatsuo in 1947/48 at the Minoro dojo, Koza City. He was born October 13, 1914. Kaneshi is a "Shinpu" or Shinto Priest of the Seicho No Ie (House of Growth) and was a successful business man. At the time of the interview he was retired. Shigema Genyu was born December 3, 1929. He started with Shimabuku Tatsuo in 1953. Shigema at the time of the interview, worked for the Marine Corps Food Service at the Futema Air Station SNCO Club. He has been working there for the past 15 years. He worked for Camp Courtney SNCO Club 35 years ago. Tatsuo could not speak english so would have Shigema teach the Americans. Kaneshiro Kenji Sensei was born April 10, 1931. Kaneshiro began training from Tatsuo around 1953/54. He brought Shimabuku Sensei his first karate gi in 1949. He is a lawyer and at one time an english translator. He formerly worked in the Prosecutor's Office. Kaneshiro is a good friend of Ikemiya Hiroshi who, at the time, was a Gushikawa City Councilman. Ikemiya set up this interview at Advincula's request. ADVINCULA: Does Kaneshi have picture of Megami and was it copied from any other picture ? KANESHI: It is not copied. Megami was painted by my uncle according to Tatsuo Shimabuku's description. ADVINCULA: What does the dragon in the picture stand for ? KANESHI: The dragon stands for Shimabuku Tasumaki (tornado or water spout), there is a dragon in tatsumaki ("tatsu" is dragon and "maki" is winding). He (Tatsuo) dreamed in a vision the dragon. ADVINCULA: Then it is OK to say that the dragon in the Megami is Tatsuo. ADVINCULA: Is it OK to call Mizugami or Megami ? KANESHIRO: This has nothing to do with Mizugami. This is not a Water Goddess. Every martial arts has a vision or symbol. One day he (Tatsuo) had a dream. Goddess (Megami) came to him and said teach everyone. This God or Goddess was at first not clear to Shimabuku. It came riding on a dragon. The Goddess talked to Shimabuku saying he had enough karate knowledge to teach publicly. This was his own God which told him. Shimabuku was a Sanjinso, fortune teller, so he had more religious beliefs than most. Shimabuku went to a frame shop and saw a picture similar to the one in his dream. He borrowed the picture and had the Megami made up. KANESHI (interrupts): This is not right. I went to Shuri with him (Tatsuo). KANESHIRO: I heard he went to Naha and got the idea from there. KANESHI: Shuri, and we had two pictures made. One for me and one for Shimabuku. It doesn't make any difference what God it is, it's his God. Bu No Kamisama (God of the Martial Arts). That's how much he was into the martial arts. KANESHI: That is not wrong. INTERVIEWERS NOTE: Tatsuo told me the same story and it was confirmed by Shinsho (2nd son of Tatsuo). Shinsho shows a picture of the Megami that is in one of Tatsuo's old fortune telling books. The Goddess is Kannon or the Buddhist Goddess of Mercy. Both Tatsuo and Shinsho call it Megami for short. Tatsuo also called it Kamisama. The Goddess is often depicted as a woman seated on or riding on a dragon. Sometimes the Goddess is depicted standing next to a dragon. Goddess in Japanese is "Megami".